With the weather finally clearing up, we were looking for a place to go which would take advantage of the big, round, burning thing in the sky (yes, that is the Sun if you had missed it in April). We did consider Granville Island, but the crowds and traffic really didn't suit our fancy. As a backup plan of sorts, we headed over to an ol' favourite - Lonsdale Quay. Honestly, if it weren't for its choice location, I'm not sure if there is much motivation for us to buy anything there. Almost everything is so darn expensive! Case in point, we checked out some Lego at the toy store and wow, it makes Toys R Us look like a bargain. I guess the prices reflect the touristy ambiance of the market I suppose. One of the main reasons we chose to come here was due to Beaver Tails. You see, my son loves them and well, we spoil him (as well as our daughter). Upon entering the market from the parking lot, I stopped dead in my tracks. What's this? 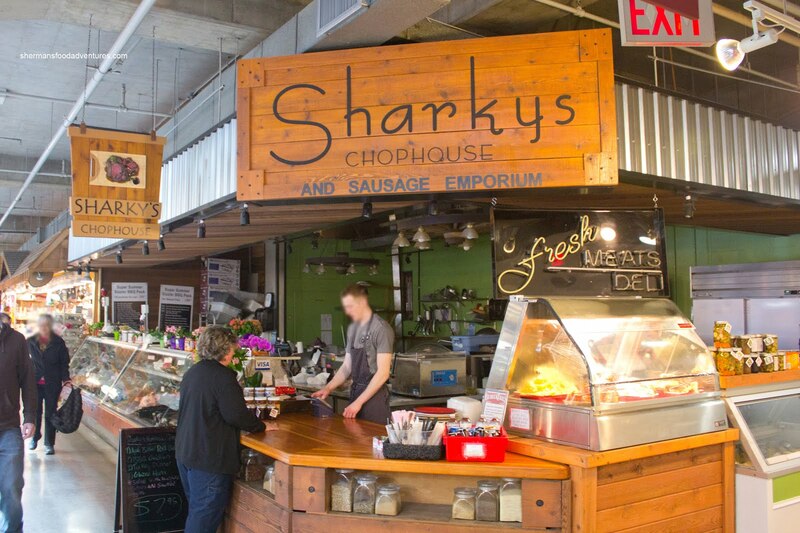 Sharky's Chop House and Sausage Emporium? 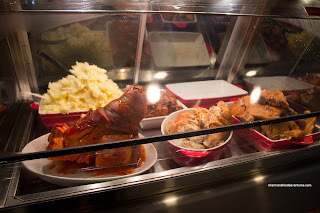 No, it didn't have anything to do with the sausages either... Rather, it was the heated display of a whole ham hock, turkey and pork chops that caught my attention. And when I rounded the corner and noticed the price of $7.95 which included a meat, mashed potatoes and veggies, that sounded like a deal! We got 2 plates with a mix of 2 meats each. 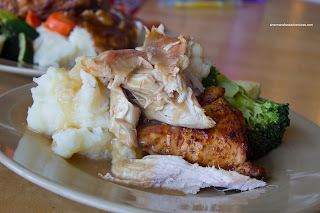 On the first plate, there was Turkey and Roast Chicken with homemade gravy. The turkey was predictably dry. The one saving grace was the gravy which was natural tasting and not salty. The chicken was also pretty dry, but it was better than the turkey at least. It could've stood for more seasoning. The mash potatoes were not the creamy, whipped variety, rather being the chunky potatoey version. We didn't mind it. 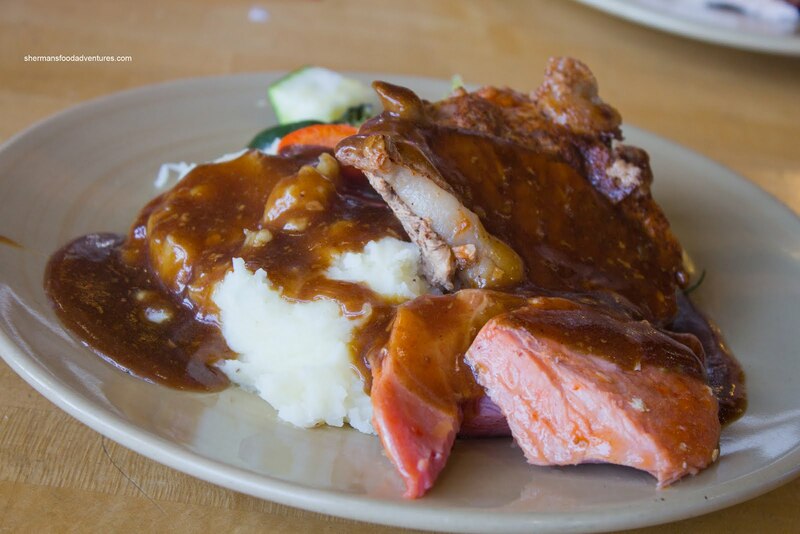 For our second plate we had the Ham and Pork Chop with a thick house-made beef gravy. The ham was also dry and a bit salty while the pork chop was really dry and chewy. Again, the gravy saved the day. It was rich and very flavourful. If I had to rate the food based on the meat, it would be subpar, but as a whole considering the price, it does the job. I will give them the benefit of the doubt because the meat is precooked and kept in the warmer until someone orders a plate. However, there is no denying that the meat could be prepared a tad less dry considering it will be exposed to more heat for a period of time.